It may not feel like it lately, but winter is on its way to the Upstate, and we want you to be ready! As much as we’d all like to sit around under fuzzy blankets in our cozy pajamas sipping hot chocolate by the fire, things like failing HVAC units, leaky roofs and frozen pipes can mess up those plans pretty quick. To help keep you nice and cozy when the temperature drops and we get our first blanket of snow — or ice, as the case may be — here are eight tips for winterizing your home. 1.) Seal all windows and doors. Keep all that warm air inside where it belongs! Before winter hits, take the time to make sure all windows and doors are properly sealed. You can have an expert re-seal them, and local hardware stores sell DIY kits if you’re the handy type. In a pinch, old blankets, towels or other thick linens will work. Another beneficial project is checking the exterior and drywall of the home and re-caulking any holes found there. That extra time will save you some heat and worries later on. 2.) Check your heating, ventilation, air conditioning system. When was the last time your serviced your HVAC system? The last time it had a problem? Then it’s probably a good idea to have it checked out to make sure you don’t run into any problems on a snow day. Unless you have extensive knowledge of HVAC systems, it’s best to leave these fixes up to the pros. They’ll check things like the thermostat, pipes and connections. You can help out by making sure you have clean filters in the system so it operates at its best. 3.) Clean out the chimney. If you have a fireplace, make sure to have it professionally cleaned before you keep a fire going all winter long. Foundation shifts, damage from the weather and buildup from fires can cause some serious problems. Again, since this is a pretty specific task, it’s best to leave it to the pros. 4.) Inspect the roof, gutters and downspouts. 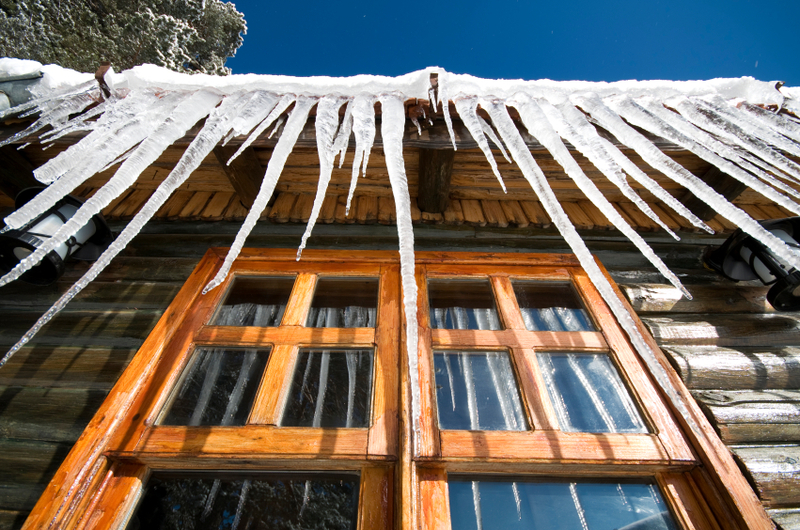 Weak spots in the roof can be a nightmare when snow and ice hits. If you have any missing shingles or notice any leaks, it’s a good idea to have the roof inspected and address any issues immediately. Also make sure the roof is properly insulated to help keep the heat inside. Downspouts and gutters also need a thorough check before winter weather hits. Dirt, leaves and other debris can cause issues when precipitation hits, and when that turns to ice, things can get ugly. 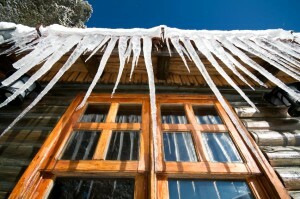 To avoid these issues, clean out gutters and downspouts before winter weather hits. Now is the time to insulate any exposed pipes or faucets. You can use foam, newspaper or any other insulation — just be mindful of pipes that get hot! You don’t want anything flammable touching those. Once insulated, use duct tape to secure the covering. Keep in mind this applies to pool equipment and sprinkler systems as well. If you want your yard to maintain its look for the winter, take time to trim the trees and bushes, put away summer furniture and planters and bring in plants. If there are any trees near your home you’re concerned about, look into removing the limbs either yourself or with a professional service. Weak or dying trees can’t stand up to the ice and snow, and it’s better to prevent a problem then deal with it later. Keep salt and deicer handy for stairs, walkways and the driveways so you’re not stuck ice skating home! 7.) Put the ceiling fan in reverse. This little-known feature is crucial in the South where we have all four seasons (sometimes out of order, and sometimes all in the same week). Reversing your ceiling fan in the winter pulls cold up air and pushes down the warm air to keep you toasty. When the temps start to rise again, just flip the switch to cool off. 8.) Keep the heater temperature down. Some of us have the luxury of not splitting and hauling wood to stay warm, but that means our heating units can be a bit overworked during winter. Your heat doesn’t have to run constantly to keep the house warm. If it does, that’s a sign of a bigger issue with warm air escaping. Try lowering the temperature at night so your heater works less while you’re asleep, and utilize the sunshine during the day to help it heat the house. You can also insulate your heater to help it withstand any potential damage from freezing temperatures.